Mix all ingredients well in the food processor and spread out about 3/8" thick on teflex sheets. Dehydrate for 7 -8 hours then turn over and continue until dry, about 3 - 5 hours more. After the crackers begin to get a little hard (approx. 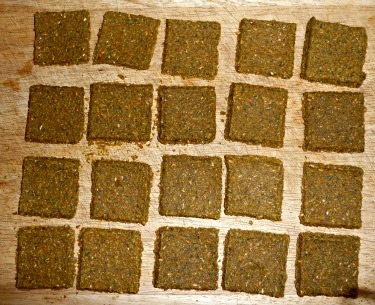 4 – 5 hrs from start) cut the crackers into squares so they can dry quicker. If you plan on making a large batch and saving them for later you’ll need to make sure they are completely dry and hard or they will mold when you put them in containers. That may take as long as 20 hours give or take, to make sure they dry. If they snap in half then they’re good and dry.